The Meadowbrook Golf Club is located on Excelsior Blvd. between Colorado Ave. and the border with Hopkins (it continues on into Hopkins). A 1914 map shows that the area that would become Meadowbrook Golf Club labeled as “St. Louis Park Suburbs,” first platted on December 17, 1887 by Calvin G. Goodrich. The property was replatted as “Meadowbrook Golf Course” on June 1, 1942. In 2008, David C. Smith compiled and wrote a history of the golf course for the Minneapolis Park and Recreation Board. The following is excerpted from that document. The course was named June 23, 1925 for its topography. Minnehaha Creek is the “brook” that runs through the course. Before it was formally named the course was referred to as the Southwest Golf Course. The only catch, initially, to the Southwest Golf Course project was that the park board had never before acquired land outside of the city limits that was not contiguous with park property. (Since 1885 the board had had the power to acquire land outside of city limits that was an extension of a park or parkway within the city limits. To be sure the board had the legal authority to acquire the land for Meadowbrook Golf Course the park board instituted a test case in the courts. Essentially the board sued itself—and won. The courts decided that the park board had the power to acquire the land and use it for a golf course. The decision was upheld by the Minnesota Supreme Court in early 1925, and Wirth was given the go-ahead to commence building the golf course. Meadowbrook was built to designs by local architect William Clark and had grass tees and greens. The first two courses in the city, Glenwood and Columbia, still had sand greens and clay tees. The course was completed, including a small clubhouse, and opened for play in 1926. 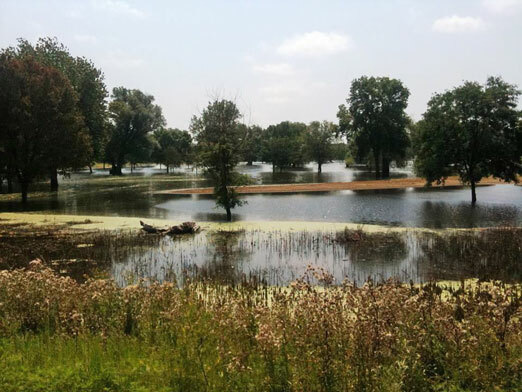 The first problem encountered at the golf course emerged in 1927 when parts of the course near a flooded Minnehaha Creek were too wet to be playable. To make them playable, nine holes of the course were closed for three seasons to dredge a twenty-acre lake from seventy acres of swamp. 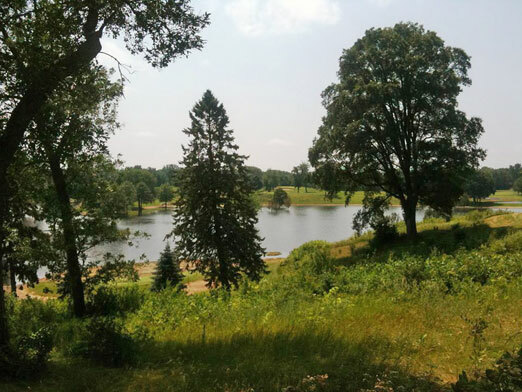 To pay for the dredging and filling, the park board borrowed another $90,000 from First Minneapolis Company, the successor to Atlas Realty, and put it on the tab. Still, the course was popular enough that in 1930 the park board managed to pay the interest on the contract and in 1931, despite the Great Depression, the park board made payments on interest and principal with earnings from the course. That would be the last year for many that the park board would be able to pay down the principal it owed. As the depression took hold, the number of golf rounds played on all city courses dropped dramatically. Even though the park board reduced fees to play Meadowbrook from seventy-five cents to fifty cents, Meadowbrook operated at a net loss. In 1933 the board announced that it was unable to make scheduled payments on the contract for Meadowbrook. By the end of 1934, with its failure to make even interest payments for a few years, the board’s debt on the property had grown from an original amount of $220,000 to $253,000. To make matters worse, summers of drought had made the golf course less appealing. In order to compete with other golf courses in the area, Meadowbrook needed a sprinkling system for its fairways. Once again the successors to the Atlas Realty contract, Merchant’s Bank Building Company, came to the rescue. The company not only put up the $40,000 for a new sprinkling system, but after that addition agreed to renegotiate the original contract, wiping out over $100,000 in park board debts. The new contract set the board’s debt for the course at $180,000. By the late 1930s and early 1940s, Meadowbrook operated at near breakeven most years and at that it was one of the most successful park board golf courses. It also charged the highest fees. In 1936 the park board instituted a season pass program for the golf courses, ranging in price from $24 for Meadowbrook to $16 for Columbia. Still, the long-ago dream of acquiring a golf course with only revenues from the course had proved illusory. By the time the original twenty-year term of the contract was up in 1944, the park board had added another $53,000 in unpaid interest to the amount of the contract renegotiated ten years earlier. The Merchant’s Bank Building Company informed the board in 1945 that it was going to take back the land for failure to make payments. The company already had a housing developer lined up to buy the land. In a final act of generosity, the company agreed to sell the land—for which the park board still owed $237,000 under the terms of its revised contract—for a cash payment of $75,000, which was less than it had been offered by the developer. To cover the purchase price and needed improvements to the course, the city agreed to sell $87,500 in bonds. The bonds were to be repaid through operating profits on the course over the next twenty years. Ultimately, golfers did pay for the course through playing fees, and the course has since become an important source of revenue for the park board. Clear park board title to the property was celebrated in 1947 when the National Public Links Golf Championship was played at the course. For years, Ann Nelson, the wife of Police Chief Andy Nelson, sold refreshments to golfers from her house at 4082 Colorado, which backed onto the golf course’s third tee. A picture of her at this endeavor can be found in the August 6, 1953 edition of the Dispatch. All that’s left in that location now is a Coke machine, perhaps in Ann’s honor. In 1968 Meadowbrook became the first park board golf course to offer golf carts to players. In 1979 the first non-golf improvements were made to property, including a canoe landing on Minnehaha Creek and a picnic area. In the summer of 2014, tragedy struck when incessant rain (not melting snow) created lakes where the golf course should have been. The course was closed for the season. The photos below were taken by Rick Sewall.